Making a backup makes sense. But doing it all by hand makes less sense. What if you forget it? That's exactly when you need it. So you automate the backup. For example, once a night, at a time when the system to be backed up has nothing to do. 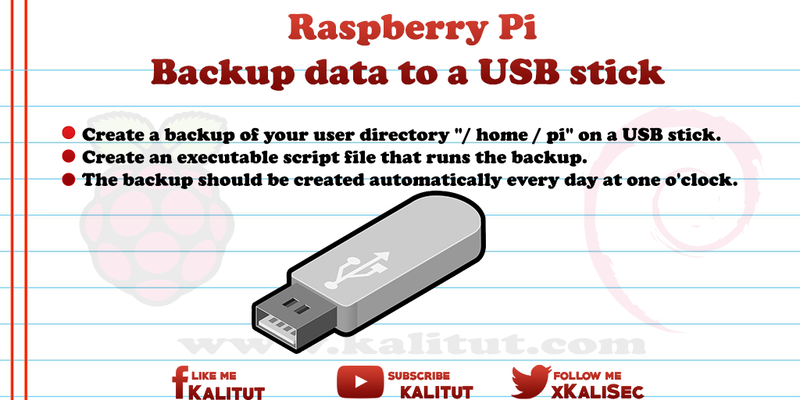 Create a backup of your user directory "/ home / pi" on a USB stick. Create an executable script file that runs the backup. The backup should be created automatically every day at one o'clock. Creating a backup usually only makes sense if you save the backup outside the system. For example, on a USB stick. For this we have such a stick when plugged in via "usbmount" automatically on "/ media / usb" integrated into the system. Automatically mount /un mount USB stick and USB hard disks with "fstab"
Alternatively, the backup can also be done on "/ dev / sda1". Only then you have to make sure that the USB stick is actually there to find. Now it's time to create a backup on the USB stick. Basically there are several possibilities. In this case we choose a fairly old program with "tar", but it is very common and exists in every Linux. "tar" creates archives with the file extension ".tar". These are summaries of files. In addition to the directory structure, rights and owners are also stored. This means that when you play back the fuse, everything is back. To create a backup, "tar" is perfect. The parameter "c" instructs "tar" to create an archive file. With the parameter "P" "tar" remembers the original location of the archived files and directories. But this also has the consequence that you can restore the files only to their original location. If you want it flexible, then you should do without the parameter "P", but you have to pay close attention to where you extract the archive. The parameter "v" lists all files during archive generation. So if it takes a bit longer then you can see where "tar" is. The parameter "f" instructs "tar" to redirect the data to a file. Originally, "tar" writes the data to a tape drive. If the archive should already exist, then it is simply overwritten. When "tar" is done, the command line returns to the input. The "tar" command not only creates an archive file but can also extract it again. Three things are different here compared to direct command input. The first line instructs the interpreter. In the second line we dispense with the screen output by omitting the parameter "v". We do not need this for automatic backup. Finally, there is an exit code in the third line. This tells the system that the script ran successfully. Then you have to make the file executable. Note: When running "tar" in the Bash file, we did not use the parameter "v". Therefore nothing is displayed now. If "tar" has created the archive, the command line returns to the input. Now you should check if the backup was really successful. If the file "backup-home-pi.tar" is displayed with the current time, the backup was successful. For such automatisms Linux brings along a tool. The so-called "Cron". "Cron" is a daemon for the time-based execution of processes and recurring tasks (Cronjobs) in Unix operating systems and thus Linux. The instructions to be executed are stored in a user-defined table, the so-called "crontab". The "crontab" is a "timeline", basically a simple table, with five or six columns. The first five serve the time (minute, hour, day, month, day of the week). Then follows the user who is to execute the script and all other characters in a line serve the statement to be executed. For example, a shell or bash script. For the backup we have already created such a script. But you should only enter those scripts in the "Crontab", which has been tested manually. The "Crontab" is a simple text file. There are two types of "crontab" that must be distinguished. User crontab: Can be edited using the crontab -e command. System crontab: Located in the file / etc / crontab. They differ in principle in that the system crontab contains a column containing the user name that is to execute the command or the script. We call the system crontab. What does that mean? We want to run the backup script every day (month and year) at 1:00 am by the user "root". Then just save and close: Ctrl + O, Return, Ctrl + X. If you 've done everything right, then the backup should be automatically created at the specified time. Serious errors are written to the "/ var / log / syslog". So if something does not work and you do not get straight to the mistake then that should be the first place to look for why it does not work. Maybe there is a hint here.